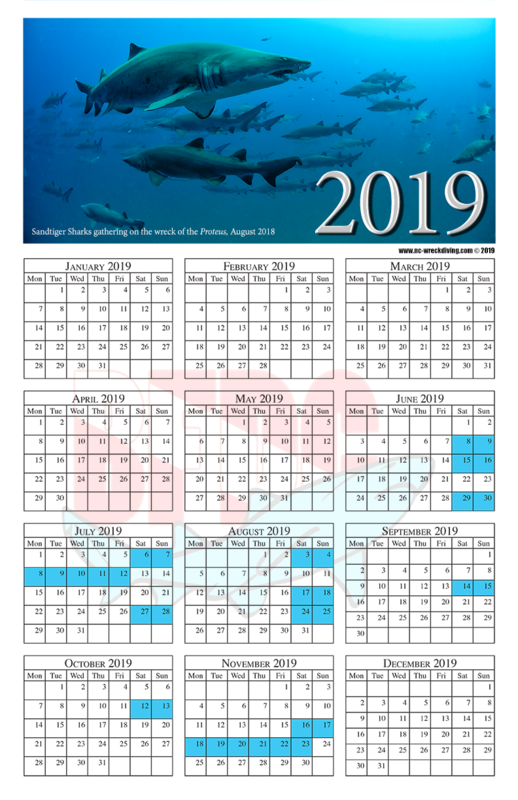 Download and Print Your Own 11x17" 2019 BFDC Calendar! Dive Schedule was last updated on 3/30/2019 at 10:00 PM. SIGN-UPS will BEGIN ON JANUARY 20, 2019! All dive sites are conditional upon weather, wind and currents. Read Diving with the BFDC for policies and procedures! Read about the dive sites before signing up. Some of these are DEEP and these are not guided or training dives. Do you have the experience? If I do not know you, please contact me before the sign-up date and let's talk about where/what you want to dive. The general rule is First Come, First Serve!...but where there is conflict, high demand, etc., I do try to give everyone at least one of their choices. All dive trips are planned for two dives, weather permitting. PRICES: The charter price is only for the boat ride and does not include equipment, gas/air, or food, etc.The economics of "6-pack" boats also lend themselves to greater year-to-year price fluctuations as there are fewer paying passengers to spread the costs over. The BFDC likes to dive with small numbers and there is a cost/value to that preference. Additionally, some of the charter boats now have a "fuel surcharge". This is a $ amount which will be added to the cost of the charter. It will vary according to how much fuel is burned  the longer trip burns more fuel! While I know this is somewhat unpopular, I think it is a fact of life until the fuel situation settles down. Still a great deal for the adventure of a life time! A word about WAIT LIST: If you are interested in a dive, but see that there is a "waiting list" for the dive, don't despair! Send me an email expressing your interest and you will be added. People's plans and life change during the year, so it is not unusual for spots to open up on individual dives and weekends. * plus "fuel surcharge" < READ THIS SECTION! ** Dive Sites will vary each day as needed to find the sharks. Default site is the Caribsea.